Children will love pretending they are little farmers throughout this theme's crafts, games, and activities! Dress up as a farmer for circle time. Fill a basket with a variety of fruits and vegetables. Have children name the fruits and vegetables one by one. Identify the characteristics of each one. Have children talk about any experiences they have had involving fruits and vegetables. Have they ever picked raspberries, strawberries, blueberries, or apples? Do they have a garden at home? Have they ever visited a farm? Transform your daycare to make it look like harvest time. Trace trees and fields onto brown paper grocery bags. To decorate the daycare, have children cut pictures of fruits and vegetables which are harvested such as apples, potatoes, tomatoes, corn, strawberries, raspberries, blueberries, etc. Deposit baskets of fruits and vegetables on your table or counter. The pictures may be used as a memory game or to spark a conversation with the group. Use them to decorate the daycare or a specific corner. 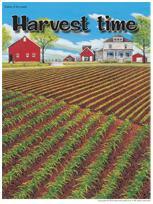 (Open picture game-Harvest time) Print, laminate, and store in a "Ziploc" bag or in your thematic bins. (Open writing activities-H like harvest) Print for each child or laminate and use with a dry-erase marker. You may use the stationery to communicate with parents, in your writing area, or to identify your thematic bins. (Open stationery-Harvest time) Print. Wooden blocks or Lego blocks may be used to build barns, silos, etc. A variety of cut fruits and vegetables can be used to make stamps. Ideally, avoid using very fresh fruits and vegetables so you don't waste them. Make your own maracas using recycled containers and various types of seeds. Make pretty vases out of empty milk cartons. Pick fresh flowers and add them to your vases. Make prints or paint using ears of corn. Make pumpkins or other fruits or vegetables using crumpled paper. Empty cardboard tubes, construction paper, and paint can be used to make tiny apple trees. Coloring pages involving fruits, vegetables, harvest scenes, markets, etc. Stencils of various types of fruits and vegetables which are harvested. At the market: fruits, vegetables, baskets, reusable bags, scale, cash register, pretend money, etc. At the apple orchard: cardboard tree displayed on the wall or a tree branch placed in a bucket to represent an apple tree, different colors of apples, pie plates, juice press, apple juice containers, pictures of different types of apples, etc. Gardening: gardening accessories, gloves, garden planters, flowers, pictures of different types of flowers, fruits, vegetables, hats, etc. 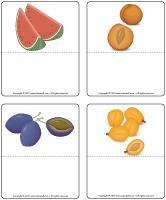 Memory game using fruit, vegetable, or flower illustrations. Association game... is this a fruit or a vegetable? A container filled with different types of beans which can be sorted by color. Various types of squash which can be manipulated or observed. Many miniature squashes are very resistant and can be kept for very long periods of time. A scarecrow could join children in the area for this theme. He can keep them company when they read. Various games which involve passing a ball from one child to another. Use an apple, a carrot, or another fruit or vegetable instead of a ball. Harvest time treasure hunt. Children search for vegetables, fruits, and flowers. Container filled with dried ears of corn. Container filled with all kinds of seeds and containers children can fill and pour. Container filled with soil and live worms. Container filled with pine needles and pinecones. Prepare a carrot and raisin salad. Prepare a salad with seasonal fruit and enjoy as a snack or dessert. Taste a variety of fruits and vegetables. Association game using seeds and illustrations of the vegetables they become. A wide range of vegetables (peeled, whole, cut in two, etc.) Children can use magnifying glasses to examine them. Make juice using various fruits and vegetables. A visit of your local supermarket can be very educational! What happens if we leave apple slices out to dry? Fill large containers with soil. Let children mix the soil with their hands as if they were ploughing it. Provide small shovels, a variety of containers, etc. Tell children they are tiny seeds in the ground (they curl up in a ball). Then, announce that it is starting to rain (children move a little, but remain curled up in a ball). The seed pokes out of the ground (children raise their head and upper body). The sun shines and the seed begins to grow (children stretch and return to a standing position). The wind begins to blow (children keep their feet firmly on the ground and sway from one side to the other). With a partner, children must move about like wheelbarrows. One child places his hands on the floor and his partner holds his feet up. One child plays the role of the scarecrow while the other children are birds. The scarecrow must touch the birds to prevent them from eating the seeds. Whenever a bird is touched, he becomes a scarecrow too. The game continues until all the children have become scarecrows. Fill a large container with soil and add potatoes. Pick apples in your backyard with your group. Prepare the apples before going outdoors (preferably before they arrive in the morning). Hang them in a tree using invisible thread. When children have picked all the apples, eat them as a snack. You could enjoy circle time outdoors, while children are eating their apples. Discuss harvest time and preserves. Attach cardboard boxes to the back of children's bicycles using a rope. Tell children the bicycles are the tractors they need to plough the fields. Deposit balls, big and small, throughout the backyard. Children ride the bicycles around the yard, collecting the vegetables (balls) and depositing them in their box. Draw lines in the sand to represent furrows. Children must hop over them. Set up a "garden" in your sandbox. Gather your fruits and vegetables from your kitchen area and hide them in the sand. Children must dig to find them. Children love jumping in big piles of leaves. This is a simple outdoor activity. If you wish, you could bring leaves inside and create a leaf storm. Of course, cleaning will be required but children will have so much fun! Provide different sizes and types of boxes and let children play hide and seek. Organize a corn roast for children and their families. Children can prepare invitations and help you peel the husk off the corn, prepare veggies and dip, pour juice, and bake a cake. Invite parents to join you and go berry, apple, or pumpkin picking with your group. Ask parents if any family members are farmers. You may be able to visit their fields and see their machinery up close. If not, they can most likely provide pictures for your group. Invite a parent or other family member to share his/her passion for gardening with your group. Ask the person to help you plant an indoor garden within your daycare. 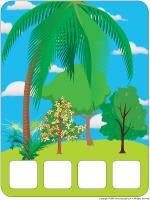 (Open magnifying glass game-Harvest time) Print and laminate the board game and the cards. Cut them out and store them in a box or in a Ziploc bag. Children pick a card and search for the item on the board game, using a magnifying glass. Once they have found the item, they deposit it in the correct square, on the board game. (Open puzzles-Harvest time) Print, laminate, and cut the pieces. Children place the pieces to recreate each scene. You will need a large bowl or basket along with plastic fruits and vegetables. Children sit in a circle, with the fruits and vegetables in the centre. Children take turns saying, "When I visit the fields, I pick..." Children then pick an item from the centre of the circle and name it before handing the basket to the next child. The next child must name the fruits or vegetables which are already in the basket and add one more. (Open fruits, pits, or seeds) Print and laminate. Collect the seeds and pits of various fruits and vegetables. Arrange the illustrations on the table. Children must associate the seeds and pits to the correct illustrations. When they are done, they can add them to Ziploc bags. Seal the bags and staple them together. Children will enjoy looking at their original picture book. (Open hunt and seek-Harvest time) Print and laminate. Children pick cards and search for the items in the picture. (Open association game-Harvest time) Print, laminate, and cut out. Have children place the cards on the correct poster: in the soil, on top of the soil, or in a tree. Build your own barn using boxes and bed sheets. Throughout the theme, provide plastic containers, empty cardboard boxes, etc. Your local grocer will be glad to give you some. Let children play in their barn as they wish. They will most likely spend hours building and rebuilding it. Children find a partner. One child closes his eyes (or is blindfolded). This child must taste a variety of fruits and vegetables and try to name them. His partner can provide clues: size, color, taste, fruit or vegetable, etc. This activity can take place over a period of a few days. Trace and cut a tree trunk out of brown construction paper (you may use brown paper grocery bags). Use adhesive putty to display it on the wall. With a pencil, trace a large circle on a piece of brown paper and add it to the top of the tree trunk. Cut 4 cm squares of green tissue paper and have children crumple them. When they are done they can glue them on the tree. (Open kind word-apples) Print the apples. Ask children to cut them out and color them red, green, and yellow so that you have different types of apples. Next, have children take a few apples home with them so their parents can write kind words on them. These apples can then be added to the tree. You may also have children suggest kind words they would like to say to a friend. Write them on the apples for them. Examples of kind words: kind, charming, happy, nice, adorable, beautiful, cute, sweet, respectful, fun, lovable, etc. Sit in a circle. Sing a song (or designate a child to sing a song). Children pass a potato around the circle. When the song ends, the child holding the potato must fulfill the singer's request. For example, the person who sang the song could ask the child to stand on one leg or perform a somersault. In rural areas, there are farmers. Grow your own vegetables, just like real farmers. Fill flower pots with soil and plant vegetable seeds. For best results, plants green beans. Water the seeds and place the flower pots in the sun. Watch them regularly. Cut slices of various fruits and vegetables. Set them out to dry. Each day, have children notice the transformation. Provide children with a variety of fruits and vegetables which contain seeds. Give them plastic knives and let them cut the fruits and vegetables to extract the seeds. You may encourage children to observe the seeds more closely by cutting them open with their knives. You may also choose to keep the seeds, let them dry, and plant them. This activity should be done at snack time to avoid wasting food. Have children select a variety of vegetables and cook them. Puree the cooked vegetables in a food processor. Children will love seeing the vegetables transform... and they will enjoy their soup. Bake apple pies with your group. Each child can make his own pie. You can ask children to bring an apron, a rolling pin, and an apple from home. Draw the steps involved on a large piece of cardboard. This will make it easier for little ones to follow along. Before you begin, children can make baker hats and wear them while they are at work. Do not discard the apple peels. Use them to create a fun sensory bin! Remove corn husks and use them to create a corn-husk character. Add eyes, a nose, and a mouth with paint, felt, foam, markers, etc. You can even cut your character's hair! Visit a local farm and purchase cow corn (less expensive). Children can dip the corn in poster paint to create original masterpieces. Cut a variety of fruits and vegetables in two (potatoes, peppers, cucumber, cabbage, apples, oranges, etc.) Children can dip them in poster paint and make stamps on paper. A great collective project is making a scarecrow. Collect old clothing items and fill them with newspaper. Attach the extremities. For the face, use an old ball. Encourage children to be creative. When you are done, set your scarecrow near the daycare entrance. Provide different types of seeds, soil, wood shavings, etc. Invite children to make collages. Collect several different types of seeds and bulbs. Let children trace them, using crayons, on a sheet of paper or on cardboard. Let them glue the shapes to make a three-dimensional collage. When they are done, they can decorate the seeds with sparkles, paint, etc. (Open creative coloring-Harvest time) Print for each child. Ask children to fill the farmer's wagon with fruits and vegetables. (Open coloring pages theme-Harvest time) Print for each child.